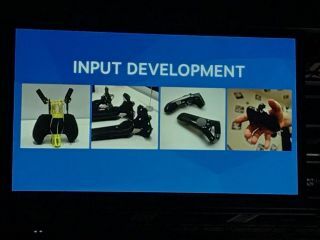 Developer talks new SteamVR controller and Steam Link TV integration. Image credit: UploadVR via Twitter. Click for original. Valve's two-day Steam Dev Days conference is currently underway, which features keynotes from itself and third-parties focused on near-term and long-term expansions to Steam. It's also an opportunity to show off VR peripheral prototypes and designs, such as a new SteamVR controller (more on that in a moment). VR is one of the hottest categories in gaming right now. Support for VR was only added to Steam six months ago, though developers have already published more than 600 VR experiences. Valve also made it a point to mention that it's licensed its SteamVR tracking technology to more than 300 companies for a variety of uses, many of which will see the light of day in 2017. While this year was primarily focused on getting headsets out the door, next year should see a bevy of product releases and supplementary technologies. This event isn't open to the public nor is there a livestream for it. That means we're mostly relying on Twitter updates for what's happening, which can be short on details. That said, we've uncovered some goodies. One of them is the aforementioned prototype SteamVR controller. The new design lets users open their hands to pick up and drop virtual objects without having the controller fall to the floor. Again, details are sparse here, but it looks as the the controller straps around the hand or wrist. This is something Oculus initially tried to do but ultimately abandoned, so it will be interesting to see what Valve's approach is. Valve also revealed that there will be a new Lighthouse base station released next year. In addition, it wants to make its Lighthouse tracking technology as "open and standardized" as Wi-Fi. Image credit: Shawn Whiting via Twitter. Click for original. The other big news coming out of Steam Dev Days so far is that Valve's $49 Steam Link accessory will be integrated into future Samsung smart TVs. Steam Link lets you stream games from your PC to other devices, such as your TV, and this seems like a logical next step. It's also a big win for Samsung, which last year announced that some of its smart TVs would gain access to Sony's PlayStation Now streaming service. With this latest development, there could be Samsung smart TV models that support both next year.